Did the Investigation Into Adnan's Track Alibi Consist Solely of a Law Student Looking at a Yearbook Page? Later, I thought that this memo was a list of sprinters on the indoor track team who likely would have been practicing with Adnan on January 13, 1999. Now, I'm pretty sure that I was wrong both times. 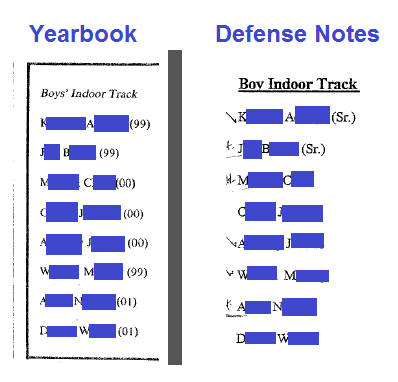 The names from the yearbook page are the same names on the defense memo. The only difference is that the law clerk apparently failed to notice that Adnan's track buddy Will was also a senior (class of '99). So, my best guess is now that Gutierrez tasked her clerk with coming up with a list of the members of the indoor track team, and the clerk responded by creating a memo based upon looking at a page from the Woodlawn yearbook. Unfortunately, the yearbook page only contained the top point scorers at a particular meet (including a few sprinters), not the names of every track team member. And then...who knows? We know that Will has said that he was never contacted by the defense team, despite the fact that his name appeared in Jay's ride-along notes. This looks like yet another dropped ball in a case with no shortage of them. When did the 99 yearbook come out, end of 99? Part of me feels bad for judging a law student that was assigned a task they had no business handling, but, seriously? If you wrote this as fiction nobody would publish it. This is literally incredible. The '99 yearbook would probably come out around May or June 1999, which would be the end of the school year for the Class of 1999 seniors. So to borrow a quote from Sarah in Serial, Adnan is the unluckiest person in the world. This is absolutely unbelievable! It just doesn't stop. Interesting, I think you might prove ineffective counsel, but innocent? Al - there's no such judgement as "innocent", only guilty (or not) beyond all reasonable doubt. The State's case does not meet that burden.